and also multiplayer ^ and a difficulty system as 1 shark wont really be that threatening once you have a crossbow or something. a skill tree would be a nice addition and have to level up crafting before you can build anything too complicated, add strength which can increase inventory space and throwing distance, agility for speed and swimming, survival for better metabolism so foods last longer etc. My thoughts on more content. More predators, and make them randomly spawn. Watching one lone shark move around my raft constantly is a bit boring. advanced construction: 1. upgrading raft foundations to make it more difficult for your raft to become damaged by storms, predators, etc. Upgrading weapons or creating new weapons, crossbow, speargun, etc. More furniture items and animations for using them. lower the floor so there is more water and the ability to swim underwater to possibly gather from the floor of the ocean. Could actually make this more of a tower defense game, with predators becoming stronger and deadlier and storms becoming more violent over time. A beginning theme that explains why your on this raft to begin with, you were on a commercial liner that sank from a storm or something to that effect that could explain a lot of the debris you constantly get out of the ocean. An AI or two that you fish out of the Ocean to help you with your raft and to keep you company. I am enjoying this game so far. I happily donated even though this version is free, I think it is worth spending the money to see what this game could become, it's already enjoyable. *Dehydration happens too fast. Maybe slow it down in the shade. *Different modes- easy-med-hard. Where the rate of hunger/thirst slows differently. I love the raft building, but feel frustrated at how much I have to stop and drink, I died so many times because I was enjoying the gameplay of the raft building and planning but forgot about water/food. I think having easy let the player go longer withoit drinking would allow for a more creative mode expirence. I have been playing again and the rate of thirst is actually pretty good for normal/med mode. Thank you Developers for this wonderful expirence so far, I know you have dedicated a lot if time and effort into this game and it really shows. Good job! graphics optimization is sorely needed. I am at a stage where my fps is 2 to 4. What if after you grow a tree it starts to attract birds you can catch them with nets and store them in cages this would allow you to carvers Eggs and Feathers Or kill them for Meat and feathers. Eggs and meat can be used to eat or the meat can be used as Bait ... will return to this idea**. Feathers can be crafted with wood to make darts or with wood and metal to make arrows ( arrows and bow could be used to "hunt" birds in the sky or shoot at shark darts could be used in a blow gun for a simmaler purpose alternitively you could construct dummies and targets for fun. Once your raft reaches a certain size it becomes easier to just fix damage to your raft than to fight the shark on a 3 strike basis. So to keep the fight alive the hunter could become the hunter. you can active this through trapping defences and hunting. let me break that down. Trapping - Like the nets that you deploy to catch the debris you could make nets that go deeper that catch fish and krill (Fish edible - Krill Bait ) you could upgrade your fishing rod with "bait" to catch bigger fish and install the rod in a trolly system on the edge of the raft to catch said Big fish. There is a Huge potential for growth automation and resource management. I love the potato farm and beat farm idea and i think this could be expanded upon through larger patches and irrigation you could build a reservoir and have pipes that drip water to the crops. Also in food you could have hoppers where you put your potatoes and make vodka or introduce Sugar cane and make rum (rum might be more location accurate). Doors would be great as well as the ability to stack column with out having floors between. Fences and or walls. BEDS to sleep through the night. Hearths for athletics and to cook on. Ovens!!! these could be used for potatoes and eggs and Bread. ... Forge made from just a tun of mental. burn wood with metal to melt it down for upgraded EVERYTHING. let me expand on that for you upgraded spear ( 2 hits instead of 3 ) upgraded Harpoon (2 Hits Instead of 3) Reenforced walls and spikes for defence that do not get destroyed from repeated attacks. Bigger chests. Solid walls ( not thatched ). reenforced pillars ( 5x5 support instead for 3x3 ). UPGRADED HAMMER ( I will refer back to the tech tree later ) with UPGRADED HAMMER you can build more adoptions into your raft such as a self purifying water station this puts a hole in the floor of your raft and rejects light down onto the water with a shiny peace of metal the water gets heated and condensates like before but instead of going into a cup like before can fill a (previously mentioned) reservoir. than used for crops or consumption. you could be able to craft components for a saw mill and a saw ( saw to cut down whole trees that take up a whole spot in your inventory and then you put said logs in the mill that processed for thatch and wood as well as pulp ). New tools (Chisel) for making decorations like statues of you and the shark. and a dredge for getting clay ( dredge could be a wood troff with metal weights on rope that you lower down into water and after a minute pull back up full of sand and clay). The clay than can be fired in the oven to make planters and large water jugs as well as Bricks and ordainments. Sand could be fired for Glass for building a green house and windows. (green house could be used to process bird poop for rare seeds that grow into banana trees and mango trees as well as flowers for the planters you made from clay). all nominating in the final frontier of scuba exploration through the construction of either a crude sub or a breathing apprentice. I do NOT think a tech tree is the right fit for this game but rather a graduated crafting system where building one thing inherently lets you build another as I have explain above finally building a forge allowing you to build a upgraded hammer then allowing you to build a whole new set of items this could double of not triple game Play time. Will multiplayer be implemented later into the game? Also i believe this game should be worth $5-10 when you plan to sell it to the public. Perhaps in the future when the game gets a bit more advanced you could add a gravity system to the raft, where if you build a couple of trees on the edge of the raft it could capsize.and if you continuously add more and more weight in the center without having the size to support it, the raft would start to sink. and in addition perhaps more refined resources and advanced structures could be added and more advanced stations to produce and refine the resources, perhaps a mulcher to turn excess biological matter (rotting food, fish meat, fruit, plant parts, etc) into fertilizer to keep growing more plants so that you have to put more effort into farming than just "build pot, click seeds on it, profit"
and with the idea of refined resources, perhaps cotton could be added and a weaving station to turn it into cloth which could be used to construct ballasts to hold up your raft and provide more buoyancy letting you put more things on your raft. defenses to protect your raft and advanced structures from additional threats. a soil fertility system where certain plants need certain fertility levels to survive. and each plant harvested removes fertility. More enemies and disasters, perhaps even include mythical sea monsters in the future. such as fish people that invade your raft. pirate raids, a disaster where temporarily there will be a big pack of sharks around your raft, about 25 - 30 that will leave after a few days but if a higher difficulty is picked there is a chance some of them would stay behind permanently until killed. Typhoons and hurricanes that toss things about, rip your raft apart, and if set to a higher difficulty. even pull the player off the raft and into the ocean. A food spoilage system that doesn't just ruin your food and is actually required to get certain items and equipment. and ways to preserve food for storage such as salting, smoking. and turning it into pemmican (essentially balls of smoked dried meat, melted fat, and sometimes dried fruit). Rare shipwrecks that can float by your raft that you can get important equipment and items from.. and an expensive way to tie them to your raft so you can thoroughly harvest everything they have to offer. such as irreplaceable mechanical items and equipment like dive suits. proper guns that get permanently ruined in water oxygen tanks, harpoons and harpoon guns. possibly wiring and diesel engines as a way to generate power for your raft that are very heavy and get ruined permanently when they get flooded because the raft sunk, or because they were not given proper shelter during a storm and where ruined that way. saw, blow torches, and advanced tools that are required to properly disassemble diesel engines in order to use the parts to repair other ones and hook up wiring throughout your raft. plastics that you can use to storm proof rooms. and when you are finally done with the boat you have tied to your raft. harvest all the delicious metal with a saw or torch. or else it must be let go. Threats and traps that make shipwrecks chancey encounters rather than floating resource piles. (something had to take away the people) such as mermen (fish people) that have lain a nest on them. rat and carnivorous crab infestations. that can either overpower you and ruin your life on the raft and devour every scrap of food on board. the crew of the vessel that ran out of food, went insane, and turned cannibalistic. exposed wiring and jagged shards of metal that can hurt and kill you that you must either wait to run out of power, cut away, or find a way around to capture the valuable fuel that is powering the wiring. And last, but not least. Quality of life improvements, plenty of bug fixes, better AI, and even possibly graphical improvements. I was wondering if it was at all possible to make this game available to more mobile devices, because I would really like to play but dont have a laptop. If you implement a food rotting system maybe think about a compost barrel that way there is a need for compost put in pots for planting. It can be a required item to build said plots. I love the plots but it would explain where the dirt comes from in game. Either that or add compost to dirt and yeild twice as much food. Maybe a sort of "story" where to receive periodic letters in bottles from the ocean? they could arrive in random order and would have to be collected and pieced together to figure the whole story? this would be a big thing but maybe a way to dive deeper into the ocean? you would have to worry about the shark but could also get cool things like stone from the sea bed or go spear hunting for wild fish in reefs? Are the devs even active for this game any more..? They're finishing up on college work. Give them a bit of time. A very good idea is to implement an automatic game update system, every time there are some bug fixes, new things in the game, this system will check and download automatically. (NOTE: This application that is present in the screenshot was the one I did to demonstrate). Hi. I love the game but there are some things that I think are exaggerated between them that when you die, you must start from the beginning, again in the raft two by two and without any of the achievements. The other is the little space in the trunks to store things which forces you to fill the raft of them to keep things that you can not carry on ... for the rest, I think a great game !!! Main issue right now? Thatch is waaay too uncommon. Since every bit of rope needs 2 thatch it becomes such a grind of patience waiting for more thatch to show up, and since literally EVERYTHING needs rope, this is a major pain. Wood isnt nearly as bad. Scrap is rare but actually becomes far too plentiful quickly due to how few recipes use it. Lastly make trees a little better ie more wood and thatch. They're rare as balls to find so should feel like it. I disagree. I found thatches to be very common but maybe that's because I concentrated on my home/greenhouse-like place than expanding on my raft. When I was playing on my second save file, I decided to make a huge greenhouse-like place for my coconut trees and food and drink sources. If you make enough tree cropplots (I made about seven), you'll have enough thatch and wood to continue your raft building. But if you don't have enough or any cropplots, you can make a lot of item nets (I made about six) to help you farm those thatches you need. It'll take a while to gather the thatches you need but it'll help if you build something else while waiting. In time, you'll gather a lot of thatches this way. Add a feature to continue to the next version without having your saves deleted. I Tried removing dead from the file name. It works! What can we find or explore? Absolutely nothing... because just have ocean and a platform to create a limited house. Any one gets over the game easily. I don't know if this was suggested before, sorry if it was, but it would be really nice having a volleyball as your companion in your adventure, you could find it in a barrel or maybe you could start with it? I guess that's up to you lads, but I'm sure a lot of people would love having a friend in the raft with you even if he doesn't give you any bonuses. 2. More fishes like: Squid & eel. The option to decide which material you use to make walls; wood, thatch, leather (for when/if skinning comes along). A 'door' that can either be an opening/closing door or just a thatch or leather drape that can be walked through. Thatch or leather rugs for floors. AKA something to drop on top of the 'ceiling' floor tiles to reinforce against any potential rain that may be implemented or just for decoration. Saving or making new barrels to collect water from any potential rain. When dying (which isn´t common atm *smirk*), don´t let us start at the worlds first beginning. Many work for hours are gone. If the game has more dangerous parts (such as diving for treasure, swimming for rescue an animal/person/something not grabable with hook) and you fail, you can continue from your last savegame. -Salt can be used to conservate your meal if decay comes into play or just for better taste plus gives more energy. Multiple abilites, if research and/or disease joins the game. -plastic and other stuff from pollution (by finding them you get new blueprints), but graduate them into common, uncommon and rare items. Keep in mind, that supporting environment is a good and necessary matter and additionally for good reputation. Maybe our rafts switch to the biggest oceancleaner world has seen. -funny recordings/videos when researching new stuff, for instance cooking some unknown stuff (mushrooms) or drinking from a found bottle (Alkohol). While beeing poisened, you are talking with the shark lying next to you on a beachchair holding a Cocktail. The rhythm of the game is too fast, often busy drinking water and eating, the items bar need to optimize, drag or take things is not very smooth, especially when the thirsty death, to the items column to get water. The mechanism of the shark is not very good, because it is always there, will not sometimes have, sometimes not. Perhaps should add some, raft defense mechanism. Need the mechanism of fatigue, need to sleep. To the end of the game most of the time in the busy production of rafts, but obviously the game mechanism can not let me peace of mind. If you can please add the online mechanism, LAN connection or WAN connection, but this is based on how much the game content. But it really can reduce the game pressure. Finally, if you can log the steam platform that is better, if there is an online mechanism, then I am likely to buy this game. Super simple i know but can we get signs to stick onto stuff? As a Youtuber playing the game I love bringing my viewers on in my survival story! being able to name buildings and such would make it 100x more epic. Tis my only real want TBH. You guys are awesome! To make an olden day scuba diving gear ( out of scrap metal and other things ) ,snorkel or even goggles. So then you can add a whole of other things when diving and going under the water. Example you could collect sand from the bottom and use it to make glass, catch crabs explore ship wrecks etc. Maybe another weapon that you could use to shoot something as well like a sling shot or a simple bow. Create a backpack to hold more stuff. Make a furnace or smelter to melt sand as well as the metal scrap. Otherwise keep going, very good idea. Enjoying the game! Plz Add Version 1.05 For MAC!! PLZ!!! me and my m8s love this game and they said they would actually pay for it if there would be multiplayer. I need new sharks food fish supplys sandboxmode please PLEASE SANDBOX MODE I LOVE BEING CREATIVE!!!!!!!!!!!!! V 1.05 For MAC!!!! PLZ!! you could add Islands (without people) with animals you can breed? I like this game A LOT so far. I would love it to go wacky places, but always staying on your raft (that's a big part of the charm for me). Maybe start a coconut company (Coconuts by mail is the next big thing!). You'll need a lot of produce, but eventually you could become a giant corporation! Declare the raft a sovereign nation, and go to war with enemy navies? Raft gets a rocket upgrade and goes to space?! Anything is possible, I love the beginning and the mechanics, just add some higher level crafting stuff (and higher-level stuff on top of that) and you're gold! Keep up the great work, or work on whatever you want next if you think you're done. Thanks for what you've made so far, I really enjoyed it for a couple hours! Haha yes that would be more like a mod for trading / setup businesses and an other one for battles / war. What an awesome game!! There's so many replies to dig through - so I'm guessing most of my suggestions would already have been said somewhere in the gigantic pile, I tried going through a reasonable number so apologies if this is just a repeat. 1. Setting up a basic background - like some small green islands on the horizon, perhaps only parallel to your journey direction so you're not travelling to somewhere per say. Whether it's continuous hill shapes, or the odd bare sea to make it 'look' like your travelling is up to you (unless the idea is that you're in the middle of the ocean with absolutely NO land in sight). In which case never mind! 2. Along with that basic background, if you're into that kind of thing, could be setting up weather climates. Such that desert looking islands (yellowish in the distance) may give incentive to create a roof to your raft to shelter you from the sun or you lose water much too quickly without it. And whiteish land in the distance could mean ice/snow, so important to not be too far away from a 'heat source' like a torch/food cooker that kinda thing, or else you may lose hunger too quickly. I guess along with that you could introduce different types of materials found in said climates. i guess it just adds a bit of variation to it all, like different fish or even using seals instead of sharks or ice covered barrels etc. 3. Multiplayer was awesome! Being able to share chests and such in the future would be amazing, and brings a bit of an added challenge when sharing the food cookers and such. 4. Beds or sleeping through the night would be neat, I guess it may fit in more if there was more consequences at night like more shark attacks etc. Day/Night cycles are excellent though! 5. Would be great to perhaps slightly increase the range/distance certain items appear. Such as making rarer items appear and last longer on screen giving the player incentive to build their way out there to collect it, whether on temporary cheap platforms (break after a day/night cycle for example) or on regular ones. 6. Ranged weapons could be thought about if there's the ideas of adding in more enemies that might attack at different times and do more than just eating one piece of the wooden platform (like shaking the raft and perhaps losing a few platforms in random places such that centrally placed items aren't 100% safe). Just motivates the player to want to get rid of the sharks rather than just letting them eat the outside pieces and not really caring too much when you have 50 around you. Anyway, maybe a bit too much there, I'm sure it's all been mentioned before, but I really enjoyed it. I greatly look forward to seeing where it goes and contributing to it where I can. All the best to your team!! Furniture crafting idea: Fish tank. I'd love to see swimming, friendly ocean fish in my raft home. The crafting recipe could be something like: Wood + Nails + Glass (found as washed up debris). Then fish for a live fish (with the fishing rod) and place the fish in the tank. Watch them swim around. Can you Update mac Version Please? i think it would be cool if there were storms or other kind of events that would either destroy part of your base or something like that along with something to help resist those events. if not that just add something to make it more challenging. Can you make it possible to put walls on the same foundation as the stairs? P.S. :Thx Google trad. This is a great idea but some sort of instructions screen would be a good idea that way it's a little easier to grasp. Relating to the earlier topic of food variety and fruit trees, you could implement a 'deep pot' for things like fruit trees (it takes up more space, but you can plant a fruit tree in it). The fruit trees should also take MUCH longer to grow than the palm trees, but should also probably be regularly harvestable for fruit. (Suggested fruit: oranges, lemons, grapefruit). A daily/bidaily autosave would be nice. I love all of your ideas. Also is that a chicken in your profile picture? Yes, her name is Thing and she likes to be cuddled. She's a Dominique, which tend to be fairly cuddly as chicken breeds go. mabbey when you make the reefs make it so you can see fish swimming around and not just the same fish as always. new fish/food? I worked very hard on this, up this if you want something in here implemented in the game and please feel free to elaborate on my ideas, as I did with some others! Suggested idea elaboration is at the bottom where it says "Other Advice or Vague Ideas:". Also, I have added a cons section to each of my created\elaborated ideas so you can better use my advice. Ropes, Bridges, Reinforcements, and Stress. To connect separate rafts you can build. 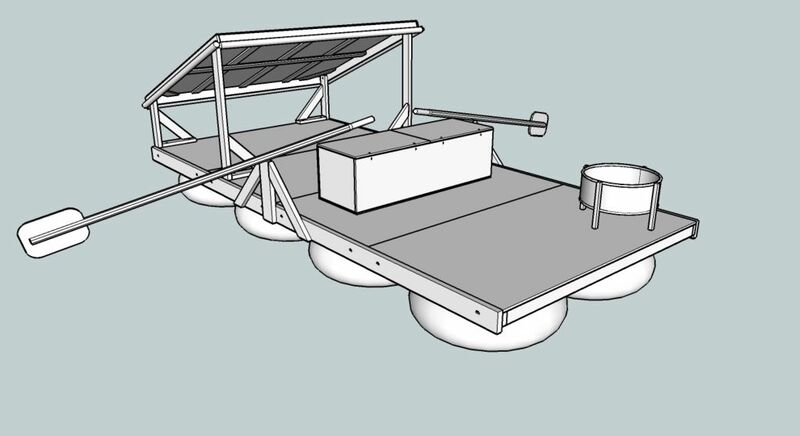 This can give the user a more community like feel with a raft for cooking, catching food, house, and collecting items. You can travel between raft segments by small bridges. Cons: This idea may take away the feeling of loneliness and survival feel you have created thus far. My advice, create a limiting factor preventing the building of massive rafts\raft segments. Create stress between connecting ropes and just floor tiles in general, at a certain point, have the player create reinforcements to prevent the destruction or division of a raft/raft segment(s). Fish net, Bait, Fish, and Expiration. This idea was copied, but I will elaborate on the idea. Fish nets require bate to lure fish - they cant just wonder in there! Bait is either grown from a seed gathered from small Islands, or crafted from other fish (You may change where they are found or made, I just gave you an idea). You can add three types of catch able fish with the net; Carnivores, omnivores, and herbivores. Herbivores are captured from placing only the grown bait in the fish net, carnivores are captured by placing meat bait in the net, and omnivores, both types. Obviously, omnivores would have to provide the most nutrients. Cons: Adding these fish may affect the difficulty of survival. My advice, create bate that are difficult to make, make said fish rare to catch, or lower their nutrition values. Immediately, you may think "That will totally and completely ruin the vibe and strategy of the game! ", allow me to explain. As the player is floating happily across the ocean, he may come across a small island, like really small-You will know how big or small you can or will (Please!) make them, to balance the game. On the islands, there can be food, rare resources for interesting items, whatever. You're the developer, i'm the humble person giving the great ideas! However, getting there is a bit more difficult. The player's raft on its natural course will completely miss the island. The player must create a grappling hook or a grounded, harpoon like gun - attached to the raft of course - to pull towards the small island. As mentioned before, the player will have to place a tremendous amount of structural support to the raft, preventing the separation of it. To refine my idea, or make it work, you can make it so that the raft can only be so big, for the grappling hook to work. Also, while the raft is being held by the gun's rope from the island, the rope will slowly break, forcing the player to leave soon after arrival. Cons: my idea here was very raw and quick-whipped. My advice, no. I strongly insist you elaborate on this idea. If I continue, I enter into a zone that is of very specific details, of which must be thought out by the developer, if he wishes to impalement this idea. Consider adding more limiting factors such as: Happiness, temperature (Copied), Stress of structures, or fertilizer for crops. I highly suggest you create a better multiplayer version of the game. I thing it will gain much more popularity that way. As I said before about raft segments, in multiplayer all players can spawn on different rafts, and in single player you can split rafts, and catch up with them later on. If you add catching up with separated rafts, add a way to slow down, speed up, and a map to know what is around you. if you are next to a separate raft or ship, or island or whatever, use the grappling hook to join up with your pal or whatever. Hey ya'll! I'm 13 and in 7th grade, ummm I play violin which is fun, i also take art lessons! Oh! My name is Justin! This, just in, a weird kid - as he calls himself - "Justin", was last seen spending hours on his computer, writing a dumb comment. I see major potential in your game, that's why I spent a lot of time making this comment of organized ideas for you. Whatever you are doing with the game though, I trust you with it, because you made it really well so far! Ps. When you add this game to steam, please don't make it too expensive! No, I am not schizophrenic. "Shut up! Leave me alone!" Jacksepticeye, 2016 or something like that, I don't care. Sorry the ending section is crappy, I got tired, now I feel like this is a school assignment. Ugh. I just need to hit that "Post" button now. Ok, I will. Peace out! These are all brilliant ideas but you have to remember their is only one programmer in the team and adding extremely complex physics like the separation of boats is extremely hard. The grappling idea was very nice but another way to balance it out would be for the rock it is connected to start to break so the player will have a limited time. Darn! Forgot to mention that I think that game hits a brick wall at some point. At a point of experience and progress, the game becomes very boring. There are no new things to build, you have a surplus of food, and the shark does not scare you any more. If you find a solution to these problems, or the overall problem, than you will attract people for longer. I highly suggest this. its really will be so cooooooll !!! This is an amazing game in the making. Simple, addicting, and fun like original minecraft. My suggestion is to keep it that way add doors, ways to light the fire on water purifier and the fire, tools, weather, and so on. But don't take after minecraft don't add a bunch of dumb stuff that ruins the game. Good work to the developers great game already i hope it succeeds like minecraft and makes its way onto steam! Good luck and good job to everyone! You could use this game to raise awareness of global warming by like putting plastic bags or dead turtles with water bottles in their mouths or you could have events. An event could be a nuke dropping and clouding the air with ash or something. You could also do a temperature thing so every year you play, the temperature and the ocean rise. Also seasons would be a cool idea. Add more resources like iron like you have a %5 chance of getting iron from barrels and add an anvil for you to do ironing like making tools and armor and add sticks to make tools :) im cool if you add the update 1.06! Add more resources like iron like you have a %5 chance of getting iron from barrels and add an anvil for you to do ironing like making tools and armor and add sticks to make tools :) i'm cool if you add the update 1.06! The game has features morning and evening time so update more small islands with new resources there. The boat of the player may randomly go to the islands. Of course, when the sun goes down and the island sinks, the player must return to the boat before sunset. This game would be great multiplayer. It would be really cool if you could go underwater and get sources and more stuff. Also it will be really helpful to have something to distract the shark, with rawfish or something. Please add sea monsters, and coop mode. Caft add extra bed, and can build more without crashing the game. I wanted to suggest that death does not destroy the save. I really don't like that I have to start all over after death. Having to start all over from the beginning is not fun and a huge piss off IMO. Also wanted to suggest recipes and a trap for sharks so they can't swim away. The game looks great, but I have two younger children who love to build stuff in games, but I don't want them to be gutting a bloody shark. Would it be possible to have a option to turn off the gore? Can you make it so we can play the newest version on mac? You can already poke it to death with your spear, and it respawns a bit later. Can there be a raft build mode, like no shark. I think everybody wants this. Please add a mechanic that lets you move the things you built. all simulators in one site! so I have a 1080 graphics card and all the best stuff and recently the game just crashes instantly. First of all, fantastic game ! Thanks for that ! It would be usefull to be able to select our own controls. ОБНОВЛЕНИЕ ПО ИГРЕ РАФТ МНОГО ИНТЕРЕСНОЙ ИНФОРМАЦИИ И ОТВЕТОВ ОТ РАЗРАБОТЧИКОВ ПОДПИШИСЬ ПОДЕЛИСЬ И ПОСТАВЬ ЛАЙК !! Rags could be found floating in the sea they would need to be dried and stitched to more rags using a needle (explained later) to make clothes. can be used to cure illness caused by freezing or overheating. It can also be used to cure infections from shark bites. Can be found in barrels or made from herbs and plants. can be used for sewing clothes and making things like bedsheets. herbs can be used to make medicine and can be found in barrels. They could also be used to make food healthier and replenish the food bar more. Seaweed and asparagus to name a few. They can be eaten if edible or planted in a flower pot. sand could be gathered from the sea floor using a plastic bucket it could then be melted in a pot and made into windows. Stone could be gained from the sea floor using a plastic pickaxe which would then be used for making things like stronger stone foundations,pillars, floor etc... It could also be used for making other things like mills to crush seeds for oil or pigment. pigment could be used for painting different objects in the game. It would need to be mixed in a bucket or made with the appropriate apparatus. Just different types of fish with different stats. 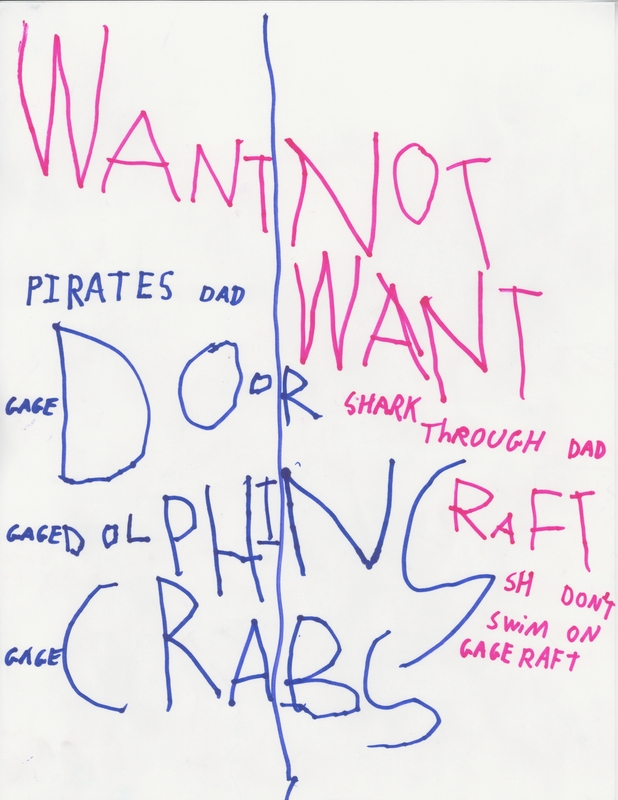 Suggestions to add to Raft by my 5 year old - He LOVES Raft! Shark swimming 'through' or 'on' the Raft. 1.Haber si lo meten y que sea feliz tu hijo y todos los demás :D, me mola la idea. Hey Redbeet, can you make the game have more things to do, more things to build, and things like landmarks or other places or worlds to explore, different types of modes (maybe a shark mode where you play as the shark (may or may not be multiplayer), or a sandbox mode), or MORE CHALENGES. Yes, more challenges. That would be great because once you have a steady food and water supply, the game becomes too easy. Hi My Name is Richard, And I Would Love To See A Multi Graphic Customization Type Setting To Enable/Disable Features Like particles And Textures Like The Tools In Your Hands Ect. It Would Also Be Cool To Add Stone To The Game When You Have To Go Under The Water To Get For Items Like A Smelting Station To Get ingots For New Tools AndPossibly Armour. I like that this game has options for most of the different systems, however am I on break right now and only really take my Chromebook with me when I'm on break. This would be the perfect game to kill some time when I have some to spend... would there be any way to make this game run on a Chromebook? There isnt much else to suggest that the first page of this post doesnt already cover but if anything id just like to remind you that YOU are the developers of this amazing game so let the community influence you but not lead you since i really dont wanna see another 7 days to die or stranded deep. The game has so much potential if you just stick with your original idea and build upon it. -Need to light fire in order to use torches and cook. -More intermediate crafting like planks, pipes, cloth, brick, etc..
* There will be islands though they'll be small in size. * Seagulls are in and will eat your crops if you're not careful. You can keep them at bay with scarecrow but Seagulls will eventually tear it apart. * iirc furnace is in (for smelting metal), and there will be research station and with it research. There are changes to existing stations as well. * There is a new resource: plastic and there are number of new fishes to fish and new crops and trees to plant. * Number of new tools will be available (makeshift binoculars and oxygen tank) and you can make better ones given materials and research. * Plenty of new things to build and decorate your raft with including upgrade options for some. And plenty more. Check out the development blog and Steam page for further information. Also do note that there is not going to be any further updates to free Itch.io version of Raft (it'll remain as free prototype/demo). All future development will be done on the Steam version. Great game, just binged for the last 4 hours simultaneously with a buddy...cant wait for the steam version and co-op. -Mid game meter such as "sanity" once you have the food/water/living situation sorted there isn't much of a challenge so incorporating sleep/rest & fun activities to keep you sane would be a decent challenge. Besides that ...all the other stuff mentioned above sounds great! and I look forward to playing more. Seagulls are already implemented in the upcoming Steam version of the Raft, to be released on May 23th with launch price of 19.99$. See relevant development blog post for further details. I know this is niche and non-standard but please add 3rd Person Perspective support to the game. Most games in the survival genre already include this, such as Ark, Conan, etc. First person perspectives make me nauseous and I can't really play them so while I would love to purchase and play the game, I will not be spending any money purchasing the game if it cannot support 3rd Person. Again, I know this is niche, but this would be a personal suggestion as I am sure there are others like me that have a hard time with 1st Person and prefer to play in 3rd Person. boarding hook - think of it! Being able to hook those drifting vessels and pull them closer, especially when you have a crosswind pushing you away. Or how about in multiplayer being able to bring your friend's ship closer during a rough storm! Or act like a pirate! Add a battery to this and BOOM! electric fence! Sails - how about adding an upgraded type? I feel the need for speed! Wheel - now you can turn your sail but you won't have to be standing right next to it! Gasp! What if you added a rudder?! Gears! - see wheel recommendation. Pounded copper plate - Eat that salmon in STYLE! Add a source of zinc, combine with copper, and now you'll be able to make BRASS . Weights - wear them when diving to sink faster and then take them off (drop/lose them) to swim up. I hope this gets the creative juices flowing. My son and I are greatly enjoying the game and I look forward to seeing it continue to grow! Done. Thank you for the guidance! *add a dedicated server, for epic battles and raft together! *add some NPCs and villages in some islands on the ocean! Trees, flowers, watermelon, pineapple, etc should give all give a minimum of one seed for the purpose of replanting. 1 seed in 5 mango trees is ridiculous imo. A rudder would be great so reorienting your boat could be done without running into islands. It would be nice if the candle in a bottle could be lit. - Definitely an engine instead of a sail, and different speeds available. as once you go against the wind its very hard to paddle back! - The ability to turn the boat 360 degrees. - Definitely like abandoned villages or something, like a larger island for loot? - My MAIN bug bear is..... food and water go down FAR too quickly. I'm eating/drinking every like 3 mins which is ridiculous! Atleast 6-7 mins would be great! I agree with a lot of your suggestions. I feel like the shark eating the middle of the raft HAS TO GO! The shark should only eat the edges of a raft. I also think a Zip line would be really fun to add as well as an upgraded axe. Fall damage will most likely be added in the future, for realism, and I hope they do add it for the games sake. Lastly, A boss fight would be pretty cool to see, it can get pretty boring just fighting sharks and birds. Plus 1 from me! -Animals that can be found on islands like pigs, cows etc. Ive been playing Raft on Steam, The game is amazing but it lacks late game content. Imagine having NPC interactions! Pirates (rare). Perhaps a floating bartering ship? Monetary systems? All just ideas but the game so far is awesome! Keep it up! Maybe I would add autosave, it happened that for some reason the game crashed or it closed and I had to do everything all over again. I really hope this game can extend its features so when you have the basics down and have everything researched you’re not just building to keep the game fun for yourself. I think it’s be awesome to add something like villages you could go to by using something like a compass and the game would only spawn the village if you have the compass obtained so you can’t find it randomly in the beginning stages of the game (just an idea.) things like this would make the game so much more fun because it gives me something to look forward to once I am getting toward the ending stages of the game! I am hoping for not just bug fixes, but NEW CONSISTANT GAMEPLAY CONTENT!!! The point of these survival games are to (survive obviously) but also make life more convenient for yourself. This game needs a higher level feature of using materials that you can create on your boat without having to wait to find islands and manually mine for scraps for your main tools and such. You should add motor parts. Sort of like in stranded deep. Hi, i linke the game and i hope that i can give some good ideas. 1. There are too little stuff. 2. more sharks at islands will make it harder. one shark is too easy if you know how to attac him. if there are more sharks -> bigger bait for 2 sharks or more crafted with the otther big fishes? 3. use the clock to see different seasons. At winter you cant plant crops or fishing. so you must stock your food. Rudder for fixing the rotation of your raft, slight bonus to fighting the wind with sail and paddle. Fighting with Bruce could be more fun. I would like to see enemies like a giant octopus or squid, and maybe even the Kraken during a storm. If you ever come up with PVP that would be cool too. Other than that, me and my friends are loving the game. 1. A Smithy to craft better tool like the metall spear. Is there going to be a PAUSE button added? It would be handy when RL stuff comes up. Seconded. Save/quit is a work around, but a pause would be quicker and easier. Found that if you turn off allowing Friends to join the game will pause with ESC. Hi, its been a while since comment but, I just downloaded and played the game. I havent read all the comments but yet there is something I would have like to have in game and its perhaps a slow calm and relaxing music. I tought it might have been by design but, if in the debris we can gather there was more useless stuff like old bottles or balls or stuff just to hang somewhere, but also a music box. A music box that the player would have to crink to get like 15-30 sec of music. I think it would be great. thanks. a tutorial at the beginning could be helpful, along with an option to decide whether or not to play the tutorial for every new save file. a system of item upgrades would be cool. an upgraded fishing rod would catch a greater variety of fish, the hook would go farther, the spear would do more damage, the building hammer would gain the ability to build a greater variety of items, the axe would become more efficient, etc. this could even be applied to appliances; the cooking and purification appliances would become faster, nets would become wider, etc. animals other than the shark would be amazing. you could build a terrarium for turtles, a tank for fish, etc. the downside of these items could be that the shark would attack more often, and, if a creature falls into the ocean, the shark would come immediately. Several of your suggestions have already been implemented in one way or another in the Steam version of the game. Shark can't attack foundations and collection nets reinforced with foundation armor. Most tools have upgraded version made from scrap or metal. There is also upgraded grill and water purifier among others. 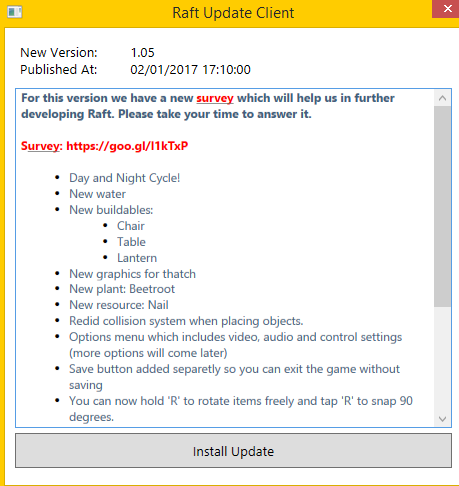 The official Raft wiki, while bit outdated, shows most of the new things introduced. There is Peaceful mode where hostile animals don't attack the player or their raft. Next large update will introduce tamable animals and animal pens among other things like personal armor and backpacks.